Steve Rice (Olympia, United States) on 11 August 2012 in Business & Industry. The remaining bronze is retuned to the furnace. As I mentioned, a number of steps remain. An interesting one is the addition of a patina. 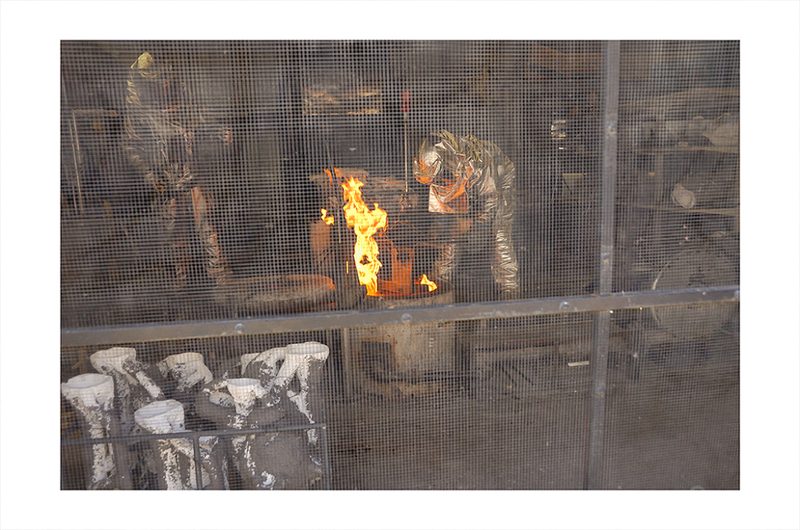 The colors on the sculptures are achieved by the addition of chemicals and heat. The foundry employs a colorist who works with the client artists to work out the color combinations desired. Avec la flamme sueprbe image et compo de ces travailleurs avec leurs combinaisons. The dangerous trade of fire's men! Superb series !Very beautiful and interesting ! A very interesting documentary series Steve ! I love the way it tells a story, around the "making of" a sculpture. wonderful series ! super shot . Oh my goodness..... it's alive!! A fine shot near the end of this process. It must be a hot job even with the protective covering. Magnificent piece Steve. Great write up too. Having worked a little bit with castings and foundries in the construction industry, I came to feel that, even in that realm, this is more of an art (or at least As much as) than a science...Superb! Great capture of their working environment; well documented photo! This image has caused me the same wonderful effect as the previous one. Like spacemen. Excellent perspective and shot. brilliantly taken through this wire mesh; interesting info, too!